Coventry city centre will be in full bloom as it competes in a prestigious horticulture campaign. Coventry Business Improvement District (BID) is pulling out all the stops to make sure that the city centre is ready for Britain in Bloom. The team have joined forces with the Coventry University Grounds Team and Coventry City Council Greening Team to go head to head with others in this year’s competition – which allows groups to use horticulture community involvement and the environment to help transform their communities. Judging day will be Wednesday, July 25 when the Chair and Vice-Chair of Heart of England in Bloom judges will spend the morning walking the route around the city centre. They will be taken on a whistle-stop tour by representatives from the BID, council and university, being shown 14 locations across the city centre. Starting at the Old Grammar School on Hales Street, the group will take in a number of sites including the Priory Visitor Centre, Coventry Cathedral, Coventry University, Greyfriars Green and ending at Finney’s Coffee Company. Trish Willetts, Coventry BID director, said everyone has been working hard together to make sure the city centre is ready. She said: “I am extremely happy and so proud with Coventry’s combined effort this year, by the time the judges arrive, we will have some beautiful displays throughout the city. “It has been absolutely fantastic having the BID, the university and the council working together on this and whatever happens, everyone should be pleased with all the hard work they have put in. 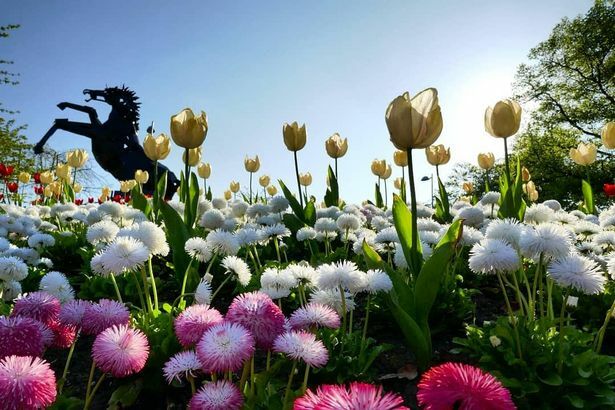 Coventry will be judged on three key attributes, which are horticulture, which includes the overall impression of the area, the maintenance of planted areas, seasonal displays, and plant selection and quality. Judges will also look at the environment - concerning the local identity, the built environment, and hard surfaces. Finally, the city will be judged on community - which looks at the year round and future considerations of the area, communication and awareness, and funding and support. Councillor Abdul Salam Khan, deputy leader said, “The city centre is looking really impressive at the moment and with all the dry weather I know it’s been a bigger challenge than usual. “Greyfriars Green is looking really spectacular and I’m sure the judges will be impressed by what they see and by the team who have all worked together to achieve such an impressive display. Stephen Beasley, Grounds Manager of Coventry University added: “This competition has provided us with the rare opportunity to work with a variety of like-minded individuals from across the city, and to showcase our gorgeous green environments. “I am delighted with the time and effort that’s been put into this by all parties, and am extremely proud that the university gets to be a part of that. no way it s to much like a concrete jungle no matter where you look britain in bloom has a soft relaxing green look not harsh concrete towering and no matter where you look with a few plants splattered here and there. If the judges are impressed they are either blind or its fixed its not like the city has living walls to their concrete towers and gardens on top it mostly slabbed how is that a green blooming city . Knowing of these cities we are going back ward here in Coventry not forward well the whole of Britain for that matter. Plus they never encourage children to help garden like most areas do its all about snobery with our council for their own prestige . I see children are not roped in to help like every where else like this.